Spot has not eaten his supper, but his mother Sally cannot find him anywhere! She begins to look all over the house for him: in the clock, under the bed, under the rug. Although Spot is not any of these places, there is always a helpful animal (or even multiple animals) to let Sally know that, no, Spot is not there. 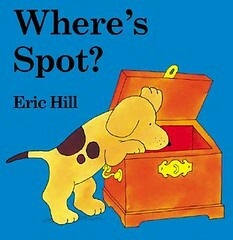 We have other Spot books, which we enjoy, but I – and Daniel – like “Where’s Spot” the best, because of the degree of autonomy it gives Daniel in interacting with the story. Vance loved board books too. He had a small one that fit his hands perfectly and carried it everywhere he went. Daniel is so cute with the Spot book – I have a feeling he’s going to be an early reader. 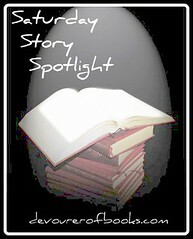 I think he might be, he’s good at the pre-reading things like telling himself a story while flipping through his books. He also steals my books from me when I’m reading and flips through them like he’s reading. We stayed with board books for a long time. I liked the fact that they were so sturdy and easy to transport in my bag. My youngest is 7 now but I can’t get rid of her fave board books. My son’s either and he’s twelve! He is just too cute! My 3 yr old also loves to read. How awesome! I hope my little one is a reader. He’ll be born at the end of May. I’ll have to remember to come back here to see what you recommend as he gets older. Thanks! That’s about the age Daniel finally tolerated it too, I think.